A year ago, a tweet by American actress Alyssa Milano helped ignite a global movement where women have raised their voices against sexual harassment and demanded recognition of, and support for, its victims. As the #metoo (“ana kaman”) movement has shifted the national conversation in the United States and helped bring hundreds of sexual harassers to justice, it has clearly had some impact in other countries as well, inspiring women all over the world to come forward in solidarity. But not all attempts to speak out are successful. In Egypt, where sexual harassment has long been a problem, one woman’s recent story was met with fines, a jail sentence and a tacit message to Egyptian women: Speak out about harassment at your own peril. The woman, actress-turned-activist Amal Fathy, was accused of sullying the country’s reputation and now also faces more serious charges of “belonging to a banned group” and “using a website to promote ideas calling for terrorist attacks.” Amal’s harsh treatment has been criticized by human rights organizations and female activists alike, but the negative publicity the case has generated for Egypt also presents an opportunity for change. Sexual harassment in Egypt is a common complaint from Egyptian and foreign women alike, and female tourists often report unwelcome comments and overtures by men. A 2018 Human Rights Watch report found that sexual harassment and violence against women “remained endemic” in the country. However, as the #metoo movement has made abundantly clear, Egypt is far from the only country with this problem, and statistics on sexual harassment paint a grim picture for women. Research from the World Policy Analysis Center at UCLA indicates that 68 countries do not have any workplace-specific protection against sexual harassment, leaving 235 million women currently in the workforce in these countries with the choice of either staying quiet or speaking out at considerable professional or social risk. And that is just at the office. Outside the workplace, women have been sharing shocking stories about sexual harassment and its impact on their day-to-day lives. 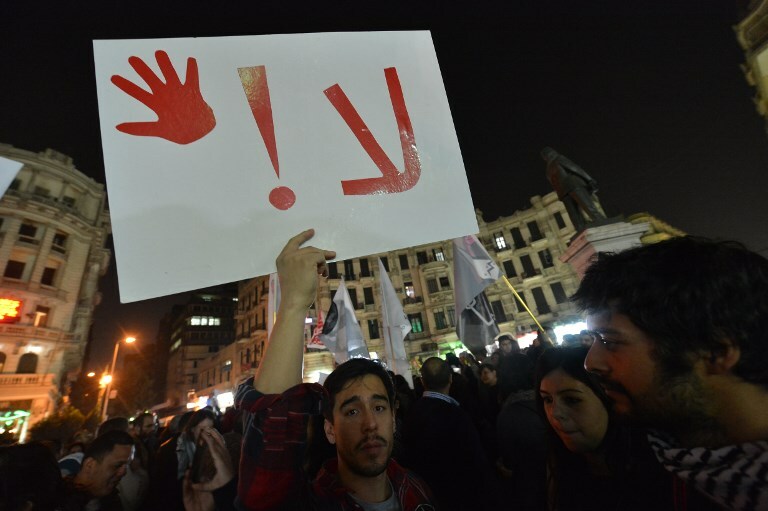 In Egypt, anti-sexual harassment laws already exist, but are not always implemented. According to an August breakdown on the website Egyptian Streets, Article 306 of the penal code declares that those found guilty of verbal sexual harassment in a private or public place can be sentenced to a minimum of six months in prison and fined a minimum of 3,000 pounds. Repeat offenders face a punishment of a minimum of one year in jail and a fine of at least 5,000 pounds. Additional offences are punishable with double the fine and jail sentence. Unwanted sexual contact is also legally prohibited. The law states that violators will be punished with a minimum of one year in prison and a fine of between 10,000 pounds and 20,000 pounds. If sexual harassment occurs at work and was directed by a manager or someone in a position of authority toward their employees, that person can be sentenced to a minimum of two years in prison and fined no less than 20,000 pounds. The maximum punishment for this crime is five years in prison and a fine of 50,000 pounds. In response to the flood of stories from women worldwide, the question now facing governments, both at the national and local levels, is this: Will you stand with women and help them live in an environment where they no longer have to fear for their dignity and their lives? Or will you suppress their voices and enable an environment of disrespect and danger? Egypt has thus far chosen the latter approach but it is not too late to turn it around. The negative publicity around Amal Fathy’s case should serve as a wake-up call for Egypt’s leadership to act, and there are several measures the country can take to lead the way toward much-needed structural and societal reforms around sexual harassment. First, the government should align its words and actions when it comes to this issue. In 2014, President Abdel Fattah El-Sisi ordered a crackdown against sexual harassment in the country. Egyptian officials also have previously urged women to report sexual harassment via their cell phones. But critics point out that neither step has ever actually materialized into tangible progress. President El-Sisi could again publicly denounce the global sexual harassment epidemic and assert that he will do his part to lead the way in tackling sexual harassment in his country. If the president lends his voice to this issue and makes it clear that this is a global problem, it could go a long way in shifting public perceptions. Next, president El-Sisi could meet with victims of sexual harassment and with anti-harassment groups to listen to their concerns and work with them on the response. For groups working against sexual harassment in Egypt, a meeting with the president would send a strong signal that he is serious about helping stem this phenomenon and would allow him the opportunity to hear firsthand stories from the victims themselves and discern the proper response, such as allocating resources to the proper officials in a way that is commensurate with the problem. In addition, the government should empower national and local institutions to hold those accused of sexual harassment accountable, and enforce existing laws on the issue. The government should make clear that if current laws aren’t implemented properly then there will be ramifications, such as demotions or even sacking of officials who are seen to discourage accusations or brush them under the rug. And although the fines for sexual harassment are already fairly steep when compared to the average Egyptian’s salary, raising them even further could act as a deterrent for would-be harassers. One year after the initial surge of the #metoo anti-sexual harassment movement, much progress remains to be made. In Egypt, the most populous and culturally influential country in the Arab world, president El-Sisi has an opportunity to stand on the right side of history, and to demonstrably advocate for, and protect, Egyptian women. I hope he takes it. Jasmine El-Gamal is a non-resident senior fellow at the Atlantic Council, where she focuses primarily on US Middle East policy and violent extremism. From 2008-2015, El-Gamal served as a Middle East policy advisor and a special assistant for national-security affairs at the US Department of Defense.